Looking for a fun activity to celebrate Valentine’s Day and to unleash your creativity while supporting a local charity? Scottsdale’s premiere Aesthetic Plastic Surgeon and artist Andrew M. Wolin, M.D. 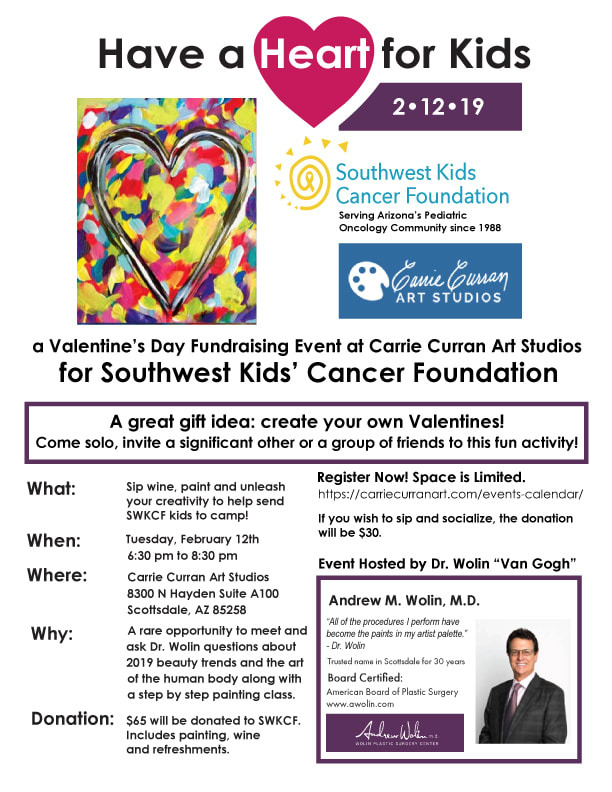 is hosting a fun Valentine’s Day event to raise funds to send the children to summer camp at the Southwest Kids’ Cancer Foundation (SWKCF), on Tuesday, February 12 from 6:30pm to 8:30pm at Carrie Curran Studios, located at 8300 N. Hayden, Rd., Suite A100 Scottsdale, AZ 85258. Enjoy painting, wine and conversation while creating a Valentine’s Day keepsake alongside Dr. Andrew Wolin. A great gift idea; invite a group of friends, go solo or bring a significant other to learn all about beauty trends in 2019, fat transfers, skin care and facial and body procedures. This is a special opportunity to meet and ask Dr. Wolin questions along with a step by step painting class taught by Carrie Curran. Participants can create up to 3 small canvas paintings inspired by love or create their own valentines! Choose one of Carrie Curran Art Studios’ many heart paintings as inspiration or come up with your own ideas. “I am really looking forward to a wonderful interactive evening of beauty and artistry while supporting the Southwest Kids’ Cancer Foundation.” said Dr. Wolin. Southwest Kids’ Cancer Foundation has been serving Arizona’s Pediatric Oncology Community since 1988 and helps children with cancer to have an opportunity to attend Arizona Camp Sunrise. For 30 years Arizona Camp Sunrise & Sidekicks has been dedicated to providing exciting, medically staffed, year-round programs for families who have been affected by childhood cancer. To attend this fundraiser please register at www.Carrriecurranart.com/events-calendar/. The donation is $65 per person with a generous portion of the proceeds will be donated to SWKCF. The event includes: painting your Valentine’s Day keepsake, wine, refreshments and tasty treats. Space is limited so register early to save your spot. If you wish to sip and socialize the donation will be $30.00 per person.